Alpine Silk Hydrating Moisture Oil 100ml with Pure Lanolin, Apricot Kernel Oil & Vitamin E!!! 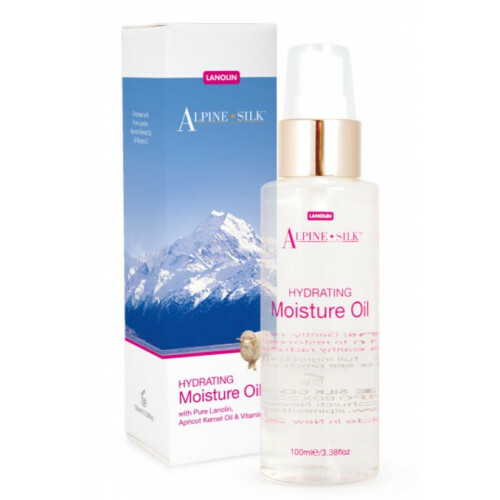 Bring out the best in your skin with this rich hydration moisture oil, created with Apricot Kernel oil, Vitamin E and Lanolin. Lanolin nourishes and aids in protecting your skin, helping to soothe and preserve its youthful healthy suppleness. Your skin will be left looking beautiful and feeling silky smooth. Apricot Kernel Oil is derived from the inner seed of the Mediterranean Apricot. The oil is highly nourishing, softening lines and restoring a healthy glow to the skin. Gently massage into your skin to restore its natural, healthy radiance. Paraffinum Liquidium (Mineral Oil), Isopropyl Myristate, Cetyl Acetate and Stearyl Acetate and Oleyl Acetate and Acetrlated Lanolin Alcohol, Prunus Armeniaca ( Apricot) Kernel Oil, Sorbitan Sesquioleate, Tocopheryl Acetate (Vitamin E), Parfum (Fragrance).